You can pay with a credit card or a debit card. We also accept payments made through PayPal. Simply select your preferred payment method during checkout. Do you ship to Military Address? Yes, we do ship to military addresses through USPS with an additional shipping fee. To find the extra shipping fee for your specific military address, please contact us via email. You will need to include your address in your email, so we can provide a quote of the shipping cost. Yes, we do ship to Alaska and Hawaii with an additional shipping fee. Send us your address in an email so that we can make a quote of the extra shipping cost. What sales tax rate do you charge? New Jersey State imposes a 6.625% sales tax for orders that ship to New Jersey. For those customers who need shipping to states other than New Jersey, we do not charge sales tax. What kind of warranty your company offer? We provide a one-year warranty against defective parts and workmanship for our bikes. However, the regular wear and tear of consumable parts such as brake pads, tires and tubes are not covered by this warranty. Send an email to info@2ksilver.com at any time and we will reply to you within 24 hours. You may also contact us through our customer service phone number at the bottom of this web page during business hours. Our business hours are 10:00 am - 4:00 pm EST, Monday through Friday. If no one is available to assist you immediately, please leave a message in our voice mail box and we will return your call as soon as possible. What are the main differences between the SP26S and the RJ26A? The frame of the SP26S folding bike is steel, and the frame size is 16.375 inches. It does not have any suspensions. Most components of the bike are made of steel. In comparison, the frame of the RJ26A folding bike is made of aluminum alloy, and the frame size is 17 inches. It has front and rear suspensions. Most components of the bike are made of aluminum alloy. I live near you in West Berlin, New Jersey 08091. Can I pick up the bike, so that I can save shipping cost? Yes, you can pick up or visit us by appointment. Send us an email at info@2ksilver.com to make an appointment. $36 for a PR20S1 bike. $41 for a SP26S bike. $48 for a RJ26A bike. Shipping costs for bike parts and accessories vary based on weight and shipping dimension. The gears make a clacking noise. It sounds like the chain is knocking against something. Do you know how I can fix this? This sound is normally created by the derailleur arm touching the chain after shifting. The derailleur needs to be either shifted further or shifted less far to move out of the way of the chain. When you hear this clacking noise, you should twist the shifter a bit so that the noise will go away. To correctly fix this problem, you will need to find whether it occurs in the front or rear derailleur. If it occurs in the front derailleur, you need to twist the left shifter. If occurs in the rear derailleur, you need to twist the right shifter. Video show how to adjust the front derailleur. Video show how to adjust the rear derailleur. When riding the SP26S bike, can you turn while pedaling? The clearance from the pedal to the front tire is six inches. If a person pedals correctly, there will be no issue while turning. But if a person pedals with his/her heels, then his/her feet may touch the front wheel when turning. The following is a link to a web page teaching people how to pedal correctly: How to Pedal When pedaling, your shoe should only extend one to two inches beyond the front of the pedal. If the pedal-to-front tire clearance on your bike is less than six inches, you may have installed the front wheel backwards. To fix this, simply remove the handlebar stem from the head tube (quick-release) and turn the wheel 180 degrees, so that the front brake assembly is in front of the fork rather than behind the fork. Then put the handlebar stem back in the head tube. 1. Check your brakes. Make sure the brake pads for both wheels are not touching the rims of the wheels (when brakes are not being applied). If a brake pad is touching the wheel's rim, the brakes may need to be adjusted or the wheel may need to be trued. Check out the videos on our FAQ page. 2. Check the tire pressure with a tire gauge. The maximum tire pressure is displayed on the tire's sidewall. Make sure your tire pressure is at least 85% of the maximum marked pressure. 3. Check the quick release mechanisms. Make sure the handlebar quick-release, frame quick-release and seat post quick-release mechanisms are locked. Observe and follow the minimum insertion mark on the seat post and handlebar stem to avoid issues. 4. A mistake that must be avoided: Make sure the brake assembly is in front of the bike's front forks. Sometimes, if the user was not paying attention, the brake assembly may have been left behind the front forks. If this situation happens, simply unlock the handlebar quick-release, then turn the wheel 180 degrees around the center line of the head tube. Now, the brake assembly will be situated in front of the front forks. Then, lock the handlebar quick-release. How long it will take to get my order? 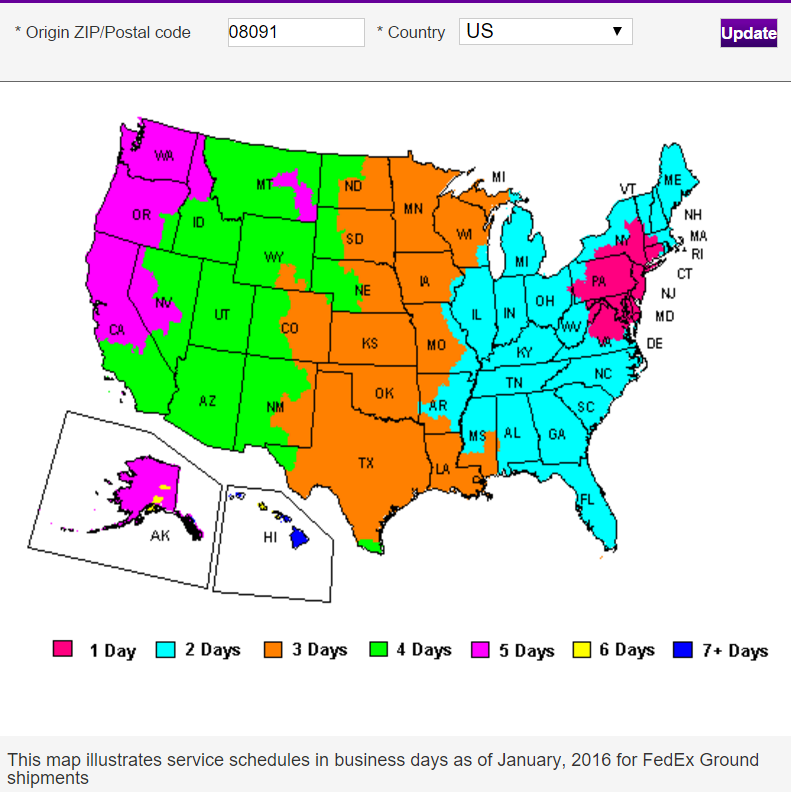 We use FedEx Ground or USPS priority mail as our carrier to deliver your orders. Our customers enjoy front-door delivery service. It normally takes one to two business days for processing and handling, plus one to five business days for transit time in the USA. So, if you live in US, your order may arrive in between two to seven business days. We have two distribution centers. One is in West Berlin, New Jersey 08091, USA. The other one is close to Los Angeles in Rancho Cucamonga, California 91730, USA. Please refer to the following graphs for a closer look at the FedEx transit time. 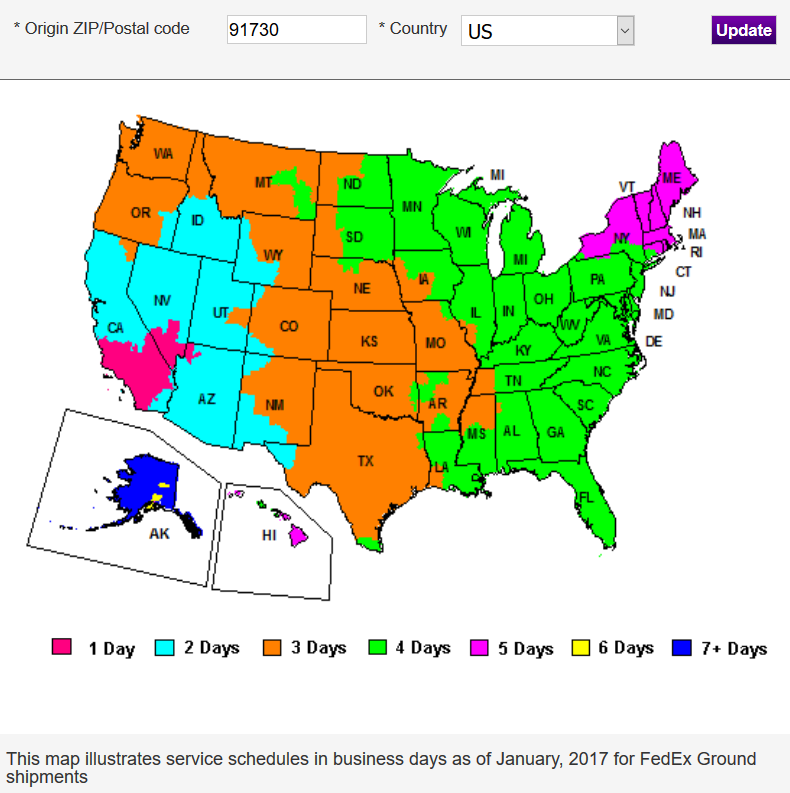 After we ship out your order, we will send you a tracking number through email, and you can track your order through https://www.fedex.com or https://www.usps.com. How to replace crank arm using a crank arm extractor(puller). Our bike has a black 14 mm nut instead of a bolt shown in the video.